Spent 6 cels of mostly unique tiles on the determined stride/run animation since the player will see that a lot. Time domain: Duration set to 4 frames for transitioning cels; 7 frames for the 2 "turning point" cels. Position domain: a "dip" of 1px set for two of the cels (worth 4 frames each) when the legs are between contact points with the ground. i experimented with having position animation free-standing from cel durations, but the yield was not enough to justify it imo. Pixel domain: The differences in movement from cel to cel were made to create an "ease in" from the turning points but end quite abruptly at the next turning point: the largest distance is covered between the last "transition" cel and the upcoming turning point. This hopefully helps reinforce the expression of determination. There's a little pixel cleanup to be done, but i think this giant rat (my biggest pain) is finally starting to come together. Just to make sure you guys think it works -- If you have any critique, let me know! I love the rat. The bounce has a lot of energy/personality. Thanks! Trying to bring out some more of that. Edit: Curbed the tail and also the ears a bit. This detail is getting close to final, if not already? Submitted. 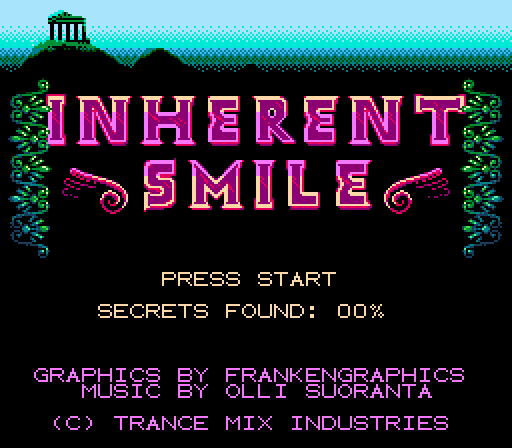 FrankenGraphics, feel free to edit the title now. That is some nice logo work! The logo and the ornaments look great! Very colorful! -Lastly, some assets had to be cut out of sheer size - which essentially means i spent precious time on the wrong things. It wasn't originally planned/asked for, but I had hoped to have time left to work on the 3d environments' GUI + additional graphics, but as it were, i was only able to finish my original assignment (design for equipment and monsters, graphics for title+ending and all the battle sceneries, enemies, equipment, battle effects and spells, boss, and then animations). I think it's a good start, but it didn't get the polish it deserves. Throw more time and ROM on it and i think it'll be quite the experience if we commit to it further. Basically, my personal lesson is that any project needs a months' buffer time in case anything unplanned affects your schedule negatively - and if it doesn't you can either spend that buffer on further polishing things, or just sit back and be satisfied. As it were i sacrificed sleep and postponed dayjob tasks to get back on schedule somewhat in the nick of time, which isn't optimal from any angle. All while calima had to deal with dependencies not being fixed on time. Comparing to the process of bringing project blue to the table, i had a couple of months more to work on that which meant the downtime i had didn't affect the project visibly.